I have spent my state government career developing innovative programs to keep seniors at home and living independently for as long as possible, including starting the PACE programs in Virginia. I joined InnovAge because I am energized and excited to work with everyone here to bring this successful PACE model to many more seniors across the country. 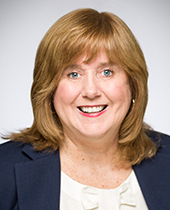 Cindi Jones is InnovAge’s senior vice president of government relations. Prior to joining InnovAge, she worked for more than 30 years in public service for the Commonwealth of Virginia – leading the Governor’s health reform initiatives, providing oversight for state agencies and programs, and, most recently, serving as director of the state’s Medicaid program for more than one million low-income residents. Throughout her career, Cindi has developed, implemented, and evaluated state health and human service programs, policies, and funding mechanisms. Cindi is a longtime advocate for the Program of All-inclusive Care for the Elderly (PACE), and holds both bachelor’s and master’s degrees in human development and family studies from Virginia Tech.